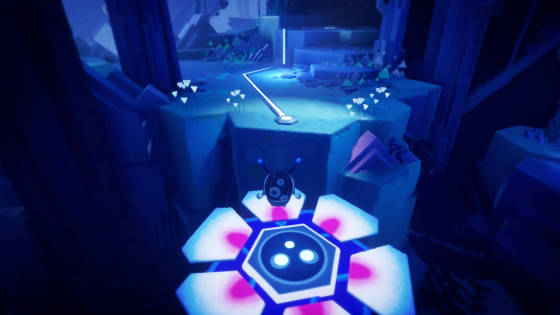 What’s in Media Molecule’s Dreams? Normally when I don’t understand a modern game – Fortnite, Minecraft, Destiny, the list goes on – I feel like a dinosaur. And I’m perfectly comfortable with that. But with Dreams, I think I’m with the majority for once. So I was keen to seek it out at EGX – and that I did. Having now waded through the disparate information knocking about online, I know that there’s a story mode made up of three intertwining tales – noir-themed mystery, childhood-horror-themed puzzle platforming, and sci-fi-themed action. It’s the last of those that made up the meatiest part of the demo I played. And it was lovely. It was pretty straightforward platforming fare, but oh so charmingly executed, with beautifully tight controls, and new ideas around every corner. And instant restarts, which frankly should be mandatory in this sort of thing. That it’s so promising isn’t surprising, because Media Molecule have a habit of producing exquisite platform games. Yes, LittleBigPlanet had extensive level creation tools, but it was also just an excellent platformer. It’s easy to forget that Media Molecule are horrifyingly talented at making games, not just making games that let you make games. And it seems like that might be overlooked again with Dreams, which is first and foremost described as “an extraordinary open-ended experience where you can make anything, from interactive adventures and platformers, to shoot ‘em ups, puzzlers and more.” Which is why no-one understands what it is. What do we want from a remake? 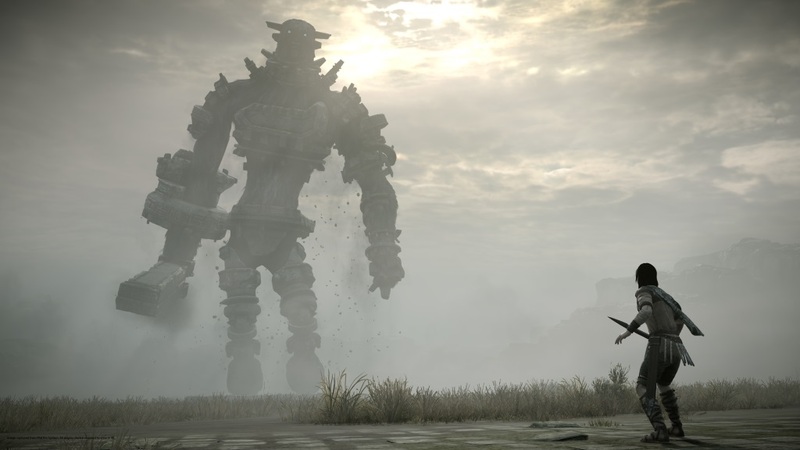 Remakes, remasters, reboots, re-releases – they go by many names, but thrusting an old game back onto physical and digital shelves is proving both common and lucrative these days. Sony have arguably been the most enthusiastic purveyors of that sort of thing this generation, the PlayStation 4 release schedule at times has looked like the PlayStation 3’s greatest hits. Their latest recycled fruit, Shadow of the Colossus, is out this week, and everyone’s pretty jazzed about it. The critical reception has been outstanding, celebrating the fact that it faithfully retains the feel of the PS2 original – as Polygon put it, “warts and all”. Is this really something to be celebrated? Disclosure: I’ve not played the PS4 version, and I’m not going to. And this is for why: I played the PS2 original, but quickly gave up, frustrated with and bored of the camera and controls. Polygon’s review of the PS4 version talks of having “battled with the camera and controls” – and goes on to slap a 9.5 score on it. Can a game be too well designed? After playing Rime, I reckon so. It was about half way through that I realised that I didn’t need to think. I stopped worrying about where to go, because I realised that Rime is precision engineered to guide the player in the right direction. It’s really, really impressive. Honestly, as a design exercise, it’s exquisite. But that makes it – as a game – a little… bit… boring. 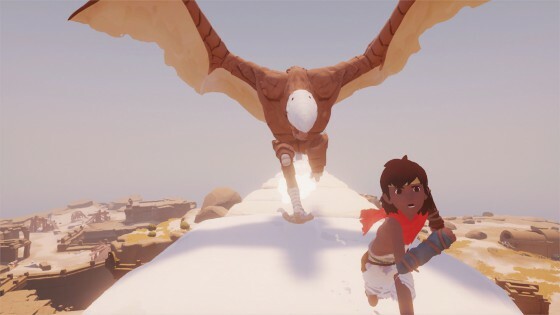 I don’t like thinking that, because so much about Rime is so appealing. The beautiful, enigmatic adventure of a young child on a strange island – sounds interesting, right? Well, let’s pick that apart. It’s unquestionably beautiful, the art style falling somewhere between Ico, Journey and The Legend of Zelda: The Wind Waker. It’s equally appealing in motion, the soundtrack is wonderful, and the controls are intuitively simple. Really, there’s nothing not to like: it’s a joy to be in the game’s world. Be anything. Pushing the definition of what we call a game. Narration by a dead philosopher. Playing itself if you let it. Everything about Everything is positively ripe for analysis, aching for discussion, gagging for scrutiny. But I don’t want to. Since playing Everything, I’ve found myself thinking about whether I found it deep, whether I identified with its themes, whether it’s art. You know, like an absolute wazzer. But that’s not what I was thinking about while actually playing it. Then I was thinking about how some of the wonky animation reminded me of French animation A Town Called Panic; thinking that the snatches of dialogue things have to share with you at one point started to sound like a particularly bleak edition of Your News on BBC Radio 4’s iPM programme. Those are, I realise, also the thoughts of an absolute wazzer, but the point is they were much more satisfying and entertaining thoughts. In 1999, MX Nitro would have been published by Midway. It’s that sort of game. A bit brash, a bit dumb, but plenty of fun with it. Think Hydro Thunder. But in futuristic 2017, it’s from Miniclip, purveyors of web and mobile games, and Saber Interactive, who have worked on everything from Halo to casino games. The modern world, eh? 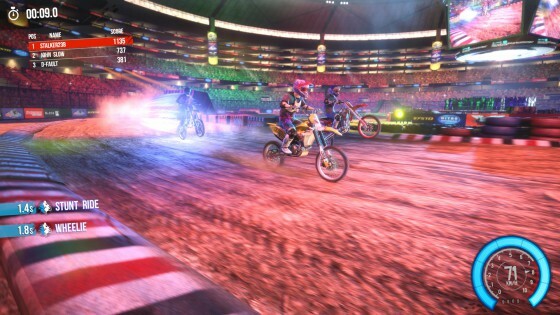 It’s not particularly helpful to know that it’s based on a browser game, because MX Nitro is a much more complete package than that might suggest. It’s not wildly original, though: this is motocross, and it adopts an approach familiar from the likes of Trials Fusion – a roughly side-on view, and no need for steering, you just take care of shifting the balance of the bike. It’s also a much better looking game than it’s origins might suggest. The actual style of presentation, however, comes from another altogether gnarlier time. The bosses – and actually the fact that there are bosses in a racing game at all – are the most jarring, with their trash talk every time you line up alongside them. It’s more quaint than annoying though. The career mode offers a surprising amount of variety. The majority of events are races of one form or another, but your competitors are largely irrelevant: there’s no interaction with them, and they perform so consistently that really it’s you against the course and the clock. It’s rare to complete a track to a decent standard and not hit the required result. That isn’t a problem though, because the courses present a sufficiently interesting challenge. There’s a lot of focus on tricks even in races, since they yield nitro boost as well as points. The task boils down to learning the course, working out how much nitro you need at any given point, and how much risk you need to take in performing tricks to earn that nitro. On the best courses it’s a completely satisfying puzzle, revealing itself over repeated failed attempts. I came to Firewatch almost completely cold. (No heat-based pun intended, or indeed incoming.) I think that added to my enjoyment, and this contains quite vague spoilers. So I don’t want to discourage you from read it, but… just saying. 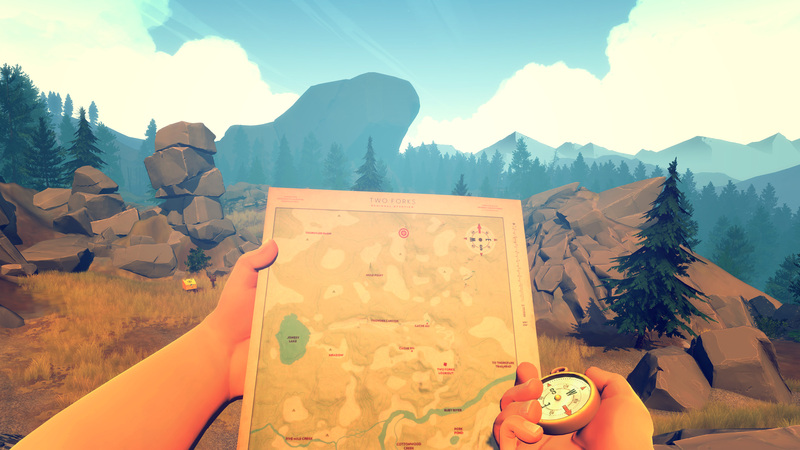 It’s certainly not a spoiler to say that Firewatch involves making decisions. It’s one of those games. I think ‘narrative’ is a fair term. I’m less keen on ‘experiential’, much like I am less keen on slamming my small toe in a patio door. If you’re a bit of a prannet, a ‘non-game’. Suffice it to say, Firewatch isn’t about fire in the same way that Jaws isn’t about sharks and Tinker Tailor Soldier Spy isn’t about spying. The point is, I very quickly identified pretty comprehensively with Henry, to the point that I was making decisions as me, not what I thought was right or clever in the game. Moderate, uncertain, weighting-up-the-options sort of answers. Perhaps it’s telling that the game presents those sorts of options. But interestingly, Keith Stuart wrote recently on The Guardian about specifically not identifying with Henry. Which possibly makes me special or wrong. With last year’s E3 conferences all about the new consoles, this year the games were the centrepiece. Sony were keen on showing us quite a lot of them. If E3 was a fight – and it sort of is, let’s face it – Sony once again stepped it up. Microsoft’s Xbox conference was an improvement on last year’s disaster, but with few particularly stand out titles. Sony’s show on the other hand, was more or less a non-stop stream of games to make the audience go “I want that!”. Although in both cases, new IP was a little lacking. Yes, that’s right. 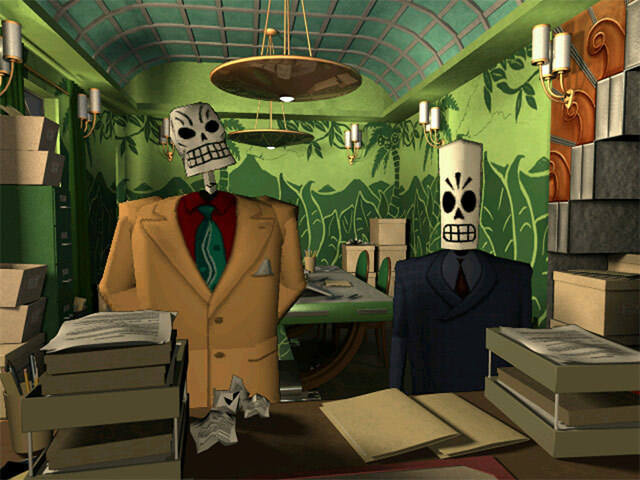 Tim Schafer’s Double Fine Productions are pulling LucasArts’ classic into the modern age as Grim Fandango Remastered, initially for PlayStation 4 and PS Vita. That will probably go down as the most unexpected announcement of E3. In terms of brilliant but non-exclusive titles, Activision’s Destiny, Ubisoft’s Far Cry 4 and Deep Silver’s Dead Island 2 all looked kind of brilliant, with Far Cry 4 in particular looking really stunning. The gameplay sequence on show highlighted the freeform gameplay, wrapped up in brilliant little cinematic moments. Remastering seems to be a theme at this year’s E3. Grim Fandango aside (and Microsoft’s Halo), Sony also presented The Last Of Us Remastered, now due for an August 1st 2014 release, and GTA V for PS4 (as well as Xbox One and PC) due this autumn. Oh, let us not forget Ratchet & Clank Remastered – don’t all rush out and buy it at once! The big new IP unveiling came in the form of Bloodborne, from Dark Souls developer From Software. It looked pretty gruesome. The trailer seemed to involve a dark character lurking in the shadows, slicing apart zombie-like corpses and hounds. Probably not exactly the type of game that’s lacking in the world, but the developers have a good track record and Sony seemed excited so we won’t be too harsh. Another original, PlayStation exclusive game on show was The Order: 1886, again. Last year we saw the trailer, this year some gameplay of a moustached man walking in the shadows. It’s due for release in February 2015. In a rather casual manner, Media Molecule came on stage to show off LittleBigPlanet 3. Needless to say, that can only be a good thing. Whilst it looks very similar to previous games in the series, new characters have been introduced with a bunch of special abilities. You won’t have to wait too long to play it, as it’ll be coming to both PS3 and PS4 in November. Once again, indie titles were a big part of Sony’s offering. 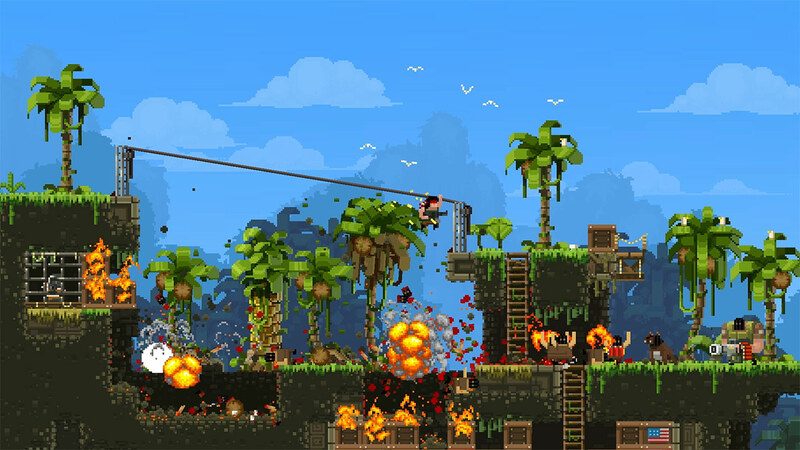 There are frankly too many to mention, but we’re glad to see BROFORCE (a retro-style side-scrolling shooter where you play as 80s action heroes smashing through destructable terrain – there’s a prototype online that’s worth a play) and Hotline Miami 2: Wrong Number coming to PS4 and PS Vita. Journey developers Giant Squid are also working on something new – the mildly pretentious sounding Abzû. We’re not sure what the game involves (although it’s mostly set underwater), but it looks very pretty. Expect hipster gaming sites to fawn over that one for awhile. Guildford-based four man development studio Hello Games (of Joe Danger fame) properly unveiled No Man’s Sky. Whilst shown as part of the indie gaming section, that might be doing it a disservice – it’s genuinely one of the highlights of the show, and one of the most interesting games we’ve seen in a long time. Getting over the fact that this Triple A worthy title is being made by just four men, the concept itself – exploring an online infinite universe full of randomly generated planets, packed with alien life and space battles – is just amazing. Look, here’s the gameplay trailer below. Look at it. Look at it! Does that not have the potential to be the best thing ever? Landing back on Earth, Sony announced that the PlayStation TV (released in Japan last November) would be coming to the US and Europe soon, for £99. It’s essentially a PS Vita chipset that you plug into your TV and control with a Dualshock pad. It plays PS Vita games natively, and also allows for remote play of PS4 and PS3 titles, as well as eventually playing streamed PS Now titles, once the PS Now game streaming service comes to Europe (it’s coming to the US and Canada this summer, but no mention about a release over here yet). Sony closed the show with a sneak peak at Uncharted 4: A Thief’s End. The footage, whilst running on a PS4, didn’t tell us too much, other than the fact that it looks very pretty. 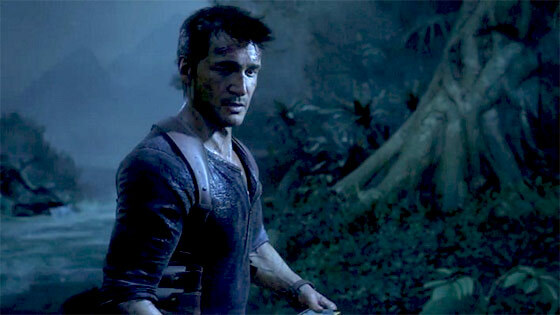 It’s Naughty Dog though, so we’re confident it will be amazing, when we finally get to play it next year. First-party PlayStation 4 game reviews went up earlier this afternoon, lighting up the likes of Twitter with some heated discussion. The main reason for this is that review scores have been, somewhat predictably, mixed. 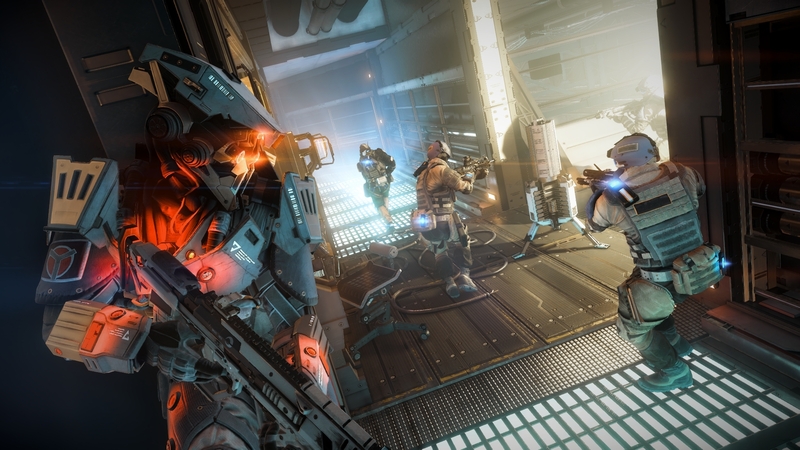 Killzone: Shadow Fall has been noted as being pretty but vacuous by many critics, while not every reviewer found solace in Knack’s purposely simplistic nature. Indie shooter Resogun has got off to a resounding start though, highlighting that gaping Geometry Wars-shaped hole in the Xbox One’s launch line-up. Incidentally, reviews of fellow indie PS4 title Constrast from Compulsion Games went live today too. Like Resogun, this will be available for free to PS Plus subscribers at launch. Kotaku quite liked it, but Polygon did not.